I don't know what it is about products in travel sized form that makes me excited and want to buy them all but it happens! Although I'm not going on Holidays anywhere this year I do often travel to visit my Best Friend and so I used that as an excuse for allowing myself to pick some of these up! However travel sized products are GREAT for when you are going away abroad or even for a weekend as it allows you to fit more junk in your bag that lets be honest you don't need but you tell yourself that you just might!..Yes we all do the same. I also love travel sized products for trying out different products as you get a good amount of product to try out to decide whether you like it or not. Starting with Face products. When I'm travelling my skincare routine changes up a lot as I don't want to be carrying around full sized bottles and tubes of things so I'll simply bring products that will cover everything! For makeup removal I will normally pack some Yes To Cucumber Wipes and even though I normally don't use wipes because they irritate my skin I find these amazing and so soothing and gentle. I'll use the wipes if I just want to fall into bed and just don't have the energy to remove my makeup properly. For the days where I'm not so lazy I bring some Simple Kind To Eyes Eye Makeup Remover. My eyes are mega sensitive and I cannot use oil based eye makeup removers however this is a lot more watery and removes even waterproof makeup! I also pack the travel sized version of my trusty Garnier Micellar Water because I am just completely in love with this product and it just does a great job at removing my makeup and not irritating my skin. Finally I'll bring along a Simple Kind To Skin Soothing Facial Toner for days where I just feel like my skin needs a bit more help. For those no makeup days I have the Sanctuary Spa Feather Light Moisture Spray, this is great for refreshing your face throughout the day. It smells absolutely amazing and I feel like my skin really benefits from using this. It is a little oily so if you'd prefer a watery spray this may not be for you. Onto body products not going to lie I wasn't even aware that miniature shower gels and body lotions even existed! Starting with shower gel I have the Original Source Mint and Tea Tree and I just adore this scent, this would be a great one to use in your morning shower to wake you up for the day. Containing 50ml of product it will definitely last a good few uses. How adorable are mini deodorants or am I the only one who feels like this? I normally stick to the invisible black and white formulas. Recently I picked up the Nivea Invisible For Black and White and the Sure Motionsense Invisible Aqua these are literally perfect for carrying around with you anywhere as they are so small. If unlike me you're not lazy and like to use a body moisturiser Palmers Cocoa Butter comes in the cutest travel sized bottle. Finally a Soap and Glory Hand Maid Hand Sanitizer for when you just want to freshen up your hands after maybe being shopping, using public transport or maybe even after a picnic! Obviously there are other things to include such as toothpaste and shampoo etc but I just wanted to show what you can get your hands on because I wasn't even aware of half of these existing! I bought all these products from Boots and nothing was over €3.50, they also currently have a 3 for 2 on travel sized products. 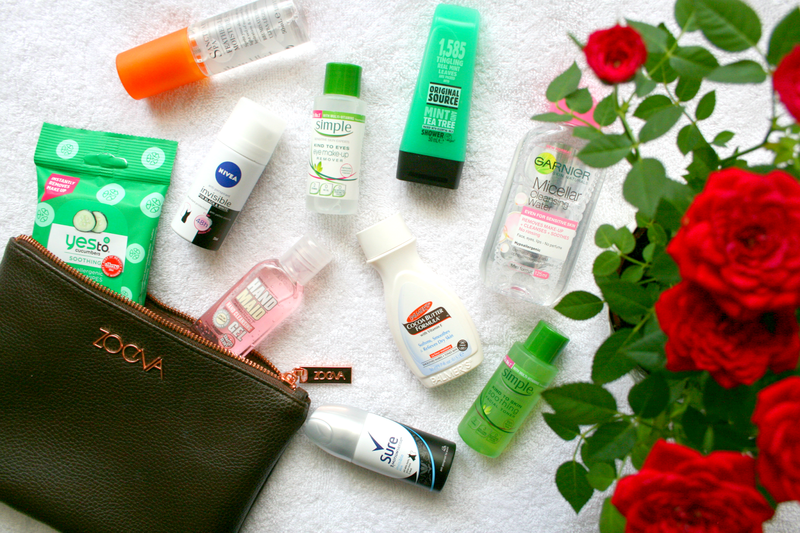 Do you bring full sized products or travel sized products with you while traveling? I'm terrible with travel sized products because I'm too heavy handed! I squeeze it once and the entire bottle has been used haha! I really like the sound of the Sanctuary Spray, sounds like what I need on no makeup days just to spritz on and be done with it! I definitely need to get something like this! I'm going on holiday to Switzerland in September and we're only taking hand luggage! There's something about travel-sized products that just makes me beyond exited to use them, even if i'm not travelling! Great posts! Everyone's hyping about this garnier micellar water, it really mekes me want to buy it eventually!